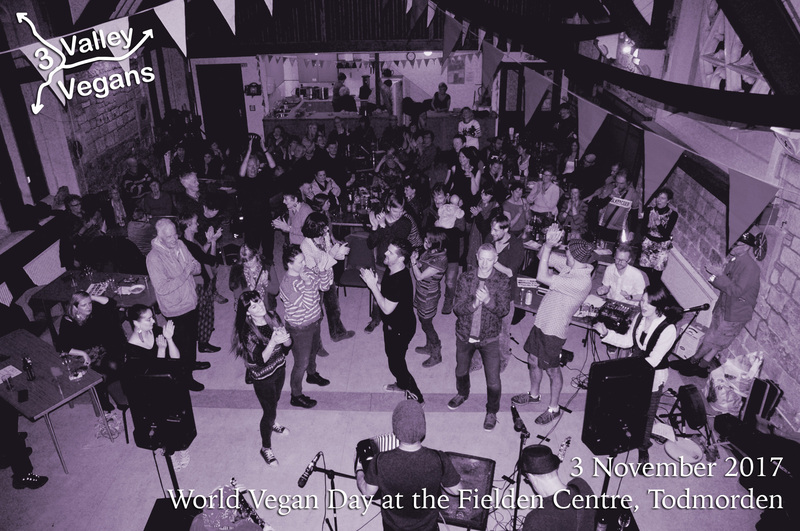 From time to time, we will be interviewing people in the upper Calder Valley, asking them to share their experiences about becoming fully or partly vegan. This time, we spoke to Kim Ashworth. Tell us more about 3 Valley Vegans from your perspective. I came across the group when my partner and I first went vegan and we were looking for local cookery classes. As a new vegan, it provided a great instant support group where I could learn from other people and have the occasional rant! We have a real range of people from all walks of life, all ages. Some have been vegan for decades, some are working towards it. We are really well-placed to make veganism more accessible and visible, as well as helping people stay vegan. It’s great to do that on a local level, as there are so many online groups but you can’t beat an in-depth conversation face-to-face. For me, the most important part is meeting people wherever they are in their journey – we welcome anyone who is against animal exploitation. What inspired you to go vegan, and when? This is going to sound incredibly millennial of me, but honestly, Instagram, in 2016. There is a huge plant-based community on there and they post such amazing looking food that before I knew much about veganism at all, I decided to give it a try. I also thought I’d be healthier without all the biscuits and cakes at work, but it turns out there are a lot more accidentally vegan foods out there than I realised! Once I’d taken animal products out, I started to do some research, and I learnt about the environmental and human health impacts of the animal agriculture industry, and of course the huge suffering of the animals themselves. It’s great to have a lower carbon footprint and feel lighter due to consuming more fibre and less saturated fat, but ultimately I do it for the animals. I appreciate that there is a complex web of ethics surrounding vegan food too, which is why 3 Valley Vegans recently decided to remove the phrase ‘cruelty-free’ from our website as a synonym for animal-free food (inspired by the Food Empowerment Project). Veganism is my personal stance for justice for the animals, as I can’t bear to contribute directly to their suffering, especially when it is completely unnecessary. I have visited a slaughterhouse and heard pigs screaming, and I simply don’t see animal products as food any more. How has veganism enriched your life? Completely selfishly, as mentioned before, it has made me eat more nourishing foods, i.e. a lot more fruit and veg, more whole grains (although I love a Quorn fishfinger sandwich every so often! ), which has helped my muscles recover faster from workouts. I didn’t expect it to, but it has also made my diet so much more varied. I would have thought that eliminating meat, dairy, eggs and honey would be restrictive, but I’ve been a lot more adventurous trying different whole foods, exploring new recipes, and I’m more interested in food than I’ve ever been (and I’ve always loved food). I’ve even made up some of my own recipes! Besides from food, delving into the world of veganism has introduced me to many other issues of social justice, and I’ve become more empathetic to the struggles of humans as well as non-human animals (greatly inspired by the Vegan Warrior Princesses Attack podcast). What tips would you give to a new or aspiring vegan? Why: First and foremost, do your research. You’re going to get a lot of questions, which may seem overwhelming, but there’s a finite list of them. I found it easiest to learn the answers! The main one is knowing your why, that you can return to in moments of doubt. How: Find a strong support network, whether online or locally (like 3 Valley Vegans!) Get some basic meals sorted – whether it’s beans on toast, pasta and sauce, a stir fry, ready-meals from a big supermarket, find your go-to meals for if you’re tired and uninspired after a long day. Finding your favourite vegan-friendly takeaway also applies! New vegan products come out nearly every day – although if you’re aiming for WFPB (wholefood plant based) I wouldn’t recommend trying to keep up! Enjoy it. Get inspired. There is so much joy in vegan food alone, let alone the wonderful community (mostly, as with all groups of people!). Find exciting recipes online, or in books. Go to new cafes and restaurants. Think of it as a journey of discovery and growth, and don’t beat yourself up if you’re not a ‘perfect vegan’. Everyone starts somewhere; do the best you can. Besides veganism, what else are you passionate about? I really love running – besides being vegan, taking up off-road running is the second best thing I’ve ever done! The Calder Valley is a beautiful area for running, and I basically wanted a faster way to explore all of the footpaths and moors around us, then I really enjoyed it and wanted to see how far I could push myself. What has been your biggest running achievement to date? I like having a chat and a snack while running, which isn’t really possible on a fast 5k, so I decided to go further rather than faster. I’ve now done ten ultramarathons (races longer than a marathon distance: 26.2 miles or 42.2 kilometres); the longest of which was 105 miles in the summer of 2018. 105 miles in one go? What was that like? It was really fun! Being out in the Lakeland mountains for nearly 40 hours was an incredible experience, one I’ll never forget…and one I can’t quite believe I managed! My feet got very wet and painful after a while, and I ended up walking the last 35 miles. It got pretty emotional, but I got to complete it with my friend and fellow vegan runner, Kate Sutton. We definitely got each other through the pain at the end! Who or what inspired you to do 100 miles? I watched a BMC film, Running Wild, about a few women doing ultramarathons around Mont Blanc. Going any further than about 10 miles seemed completely ludicrous, but I wondered if I could do it too – they made it seem really accessible, and an enjoyable challenge! Scott Jurek and Fiona Oakes, who are prominent vegan ultrarunners, are a massive inspiration to me. What is your nutrition like as a vegan ultrarunner? When I’m not racing, I try to eat loads of wholefoods – lots of veg, fruit, beans, wholegrains, porridge for breakfast, lots of greens. I use Dr Greger’s Daily Dozen app which has helped me get into it. I love meat replacements, biscuits and cake, so have these occasionally in moderation and don’t beat myself up. I try not to see foods as ‘good’ and ‘bad’, but rather as ‘nourishing’ and ‘other’, as I’ve read about how harmful the ‘clean eating’ movement can be. As soon as my partner and I went vegan, we noticed that our recovery time from workouts improved with the improvement of our diets. During races, I eat a wide variety of foods – basically what I fancy, as I don’t always feel like eating during a long race, but it’s obviously really important! On the Lakeland 100 I had pasta, crisps, Skittles, peanut butter sandwiches, sports gels, mandarin segments, all sorts! Even in my short time as a vegan, I’ve noticed that races are catering much better for us, which is fantastic. What tips would you give to someone who wants to get into running? Similar to going vegan really – find inspiration, a community, and develop a realistic way of getting into it. I think a lot of people are put off because they absolutely cane it on the road, when they might enjoy a sociable bimble off-road a lot more. (Todmorden Harriers are fantastic at this). Couch to 5k is a fantastic introduction if you’re new to running, as is parkrun. Due to biomechanics and probably our sedentary lifestyles, a lot of us have various muscle weaknesses and imbalances that can quickly lead to injury, so it’s worth incorporating strength work, warmups and some stretching or yoga into your routine as a preventative measure, and listening to your body when you get niggles so they don’t develop further. Work out what you enjoy. If you want to increase your speed and get parkrun PBs, do that. If you want to have a chat while you’re running, take a friend and take it easy (psst: you’re allowed to walk the hills!). I had a long-term goal in mind (the 100) that seemed completely impossible and scary, but I worked out how to get there, and really enjoyed the training. Some people need a focus, others want to simply run. There are so many different kinds of running out there, I reckon there’s something for most people. To find out more about 3 Valley Vegans, continue exploring this website and check out our Twitter and Facebook group & page. Scary dairy outreach in #HebdenBridge! 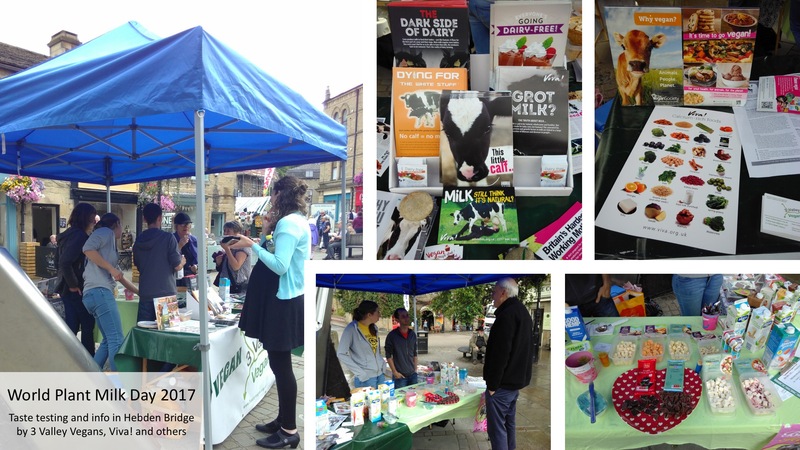 Last week, some of our volunteers hosted a stall in Hebden Bridge to talk about the first annual World Plant Milk Day. They offered taste testers of ice creams, chocolates and various plant-based milks, with access to information about why you might want to buy these products. People were receptive and interested, offering positive feedback. Thanks to Viva! for help with providing some of the materials.